MEETING WITH SUZY DAVIES, AM. We were very pleased to have a visit from the Welsh Assembly’s Shadow Minister for Tourism, Culture, and the Welsh Language, Suzy Davies. Suzy is the Assembly Member for South Wales West and was born in Swansea. She has always been a keen supporter of the Swansea Canal and she cut the ribbon in Coed Gwilym Park a few years ago at the unveiling of the Sustrans metal statues of Harry Grindell Matthews, Derek Bevan and Linda Smith alongside the canal. She is very interested in our aim to take the Swansea Canal back into the Swansea Docks via the Tawe, the Fendrod River, and along a rebuilt new canal route under the M4 and across open land to link up with the existing canal at Clydach. The Forge Fach Centre provided a conference room and all the facilities we required to present our case. We gave her a general introduction to the work of the Society and then Nigel Craddock, our Engineering Consultant, brought her up to date with our progress to keep the new canal route in the public eye. Suzy was very supportive of our endeavours and will follow up our recent meetings with the planners at Swansea Council with several initatives of her own. We are extremely grateful for her active support in this huge project. 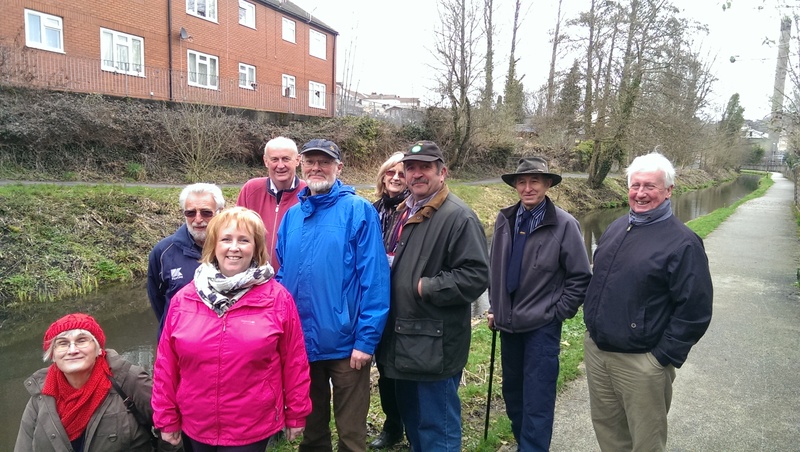 We then took her and her PA, Craig, for a walk along the canal to see the Clydach Aqueduct and the sites of the possible new aqueduct needed to take the canal across the Tawe to the eastern side of the river. Craig took the above photo of us all north of the Clydach Aqueduct. We thank both Suzy and Craig for joining us and for their obvious interest in, and support of, this project. Previous postTHE WEEK AHEAD: 14.3.15 TO 20.3.15 Next postA TYPICAL WORK PARTY DAY: 20.3.15.